While Lipton green tea doesn't have a clear advantage over any other brand, it does come with an array of important health benefits. Lipton offers pure green tea as well as flavored teas made with orange, passionfruit, berries and other ingredients. All Lipton tea bags yield calorie-free beverages, provided you don't add sugar, milk or other caloric additives. Like other green teas, Lipton's versions contain a combination of caffeine and catechins -- a type of antioxidant that alters cell-signaling pathways. These pathways control how cells in the body grow, multiply and die. Together, caffeine and catechins may help you lose weight, according to a review of 15 studies published in the "American Journal of Clinical Nutrition" in 2010. Researchers found that participants given catechins and caffeine lost more weight and experienced a greater reduction in waist circumference than those given caffeine alone. Green tea may boost your immune system, helping to ward off illnesses. In a study published in the "Journal of the American College of Nutrition" in 2007, researchers gave some participants green-tea capsules twice daily and other participants a placebo. At the end of the three-month trial, 32 percent fewer subjects in the green-tea group experienced cold or flu symptoms. In addition, those taking green tea had higher levels of gammadelta T cells, which help fight infection. While green tea is not a substitute for vaccines or other medicines, drinking it might help you stay well during flu season. A number of studies link green tea consumption to improved heart health, according to Harvard Health Publications. 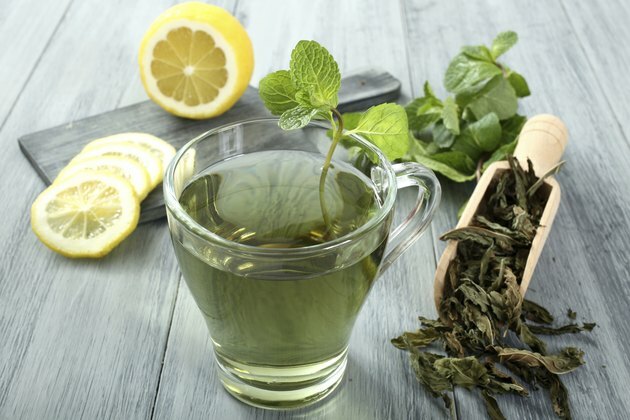 While more research is needed to confirm these results, scientists have found green tea to reduce levels of low-density lipoprotein -- the kind of cholesterol that builds up on artery walls -- as well as lower the risk of heart disease and stroke. Some of these studies were performed using catechin capsules, however, so Lipton green tea may not duplicate the effects. Freshly brewed green tea contains the most catechins, according to Harvard Health Publications. Therefore, drinking Lipton's bottled, chilled green tea may not provide the same benefits as drinking steeped tea bags. Harvard also notes that regular green teas contain more catechins than decaffeinated ones. Caffeine, however, can cause side effects such as rapid heart rate, nervousness, sleeplessness and even depression, especially among people with a low tolerance. Consuming 200 to 300 milligrams of caffeine per day is considered moderate; Lipton green tea contains 35 milligrams per tea bag.